DAREDEVIL Season 2, Episode 4 Review – Penny and Dime | Warped Factor - Words in the Key of Geek. Tony’ll take a penny for his thoughts. For all the Punisher’s arms-length bloodbathing, there’s been a sense so far in Daredevil Season 2 that the gritty realism of the fighting and violence has been sacrificed in favour of more stylised action that has looked a little less real and so has inspired a little less in the way of admiration and thrills. There’s every chance episode 4, Penny and Dime, will be seen as going too far in the other direction, because what happens in this episode is rather more akin to a Tarantino movie, or even, occasionally, an Eli Roth movie, than anything as fluffy as an episodic superhero show. Right from the off, it’s clear this episode’s remit is to turn the shock and violence up to eleven, as an incident at a wake for the Irish gang members slaughtered by the Punisher in the opening moments of the season is horrifying and gruesome. What follows is the establishment of Irish gang muscle through the control of Finn Cooley, the new man in town. We see almost a montage of intimidation, kneecapping and violence as Cooley goes to work trying to track down the Punisher – but there’s an almost unbelievable motivation behind it. Cooley lost a son in the initial attack, but he’s not particularly out for vengeance, not crazed by some blood-feud. Rather, he’s after the return of $1.2m that the Punisher stole during the attack that killed his son. That feels off-kilter, especially because we never saw the Punisher take any money in the Irish gang-massacre, so it feels oddly like new information brought in specifically to justify the storyline of this episode. 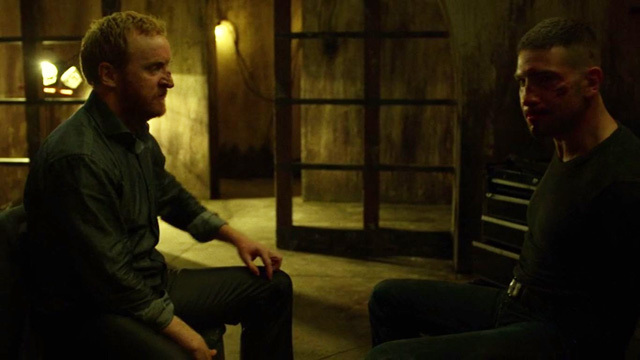 That said, Tony Curran (yes, Vincent Van Gogh from the Doctor Who episode Vincent and the Doctor) brings a character study of chilling unpredictability to Cooley, reminiscent of Vincent D’onofrio’s early appearances as Wilson Fisk, only with a fuse you somehow immediately guess is much, much shorter. There’s a degree of backstory in the way he eventually traps Frank Castle, but then, for all the sudden explosion of ultra-violence, this episode is all about Frank Castle’s backstory. With the Punisher on the loose, everybody wants a piece of him, but it’s Karen Page of Nelson and Murdock who takes unprecedented steps towards getting to know and understand the man. Convinced that the Punisher files discretely given to her by Assistant DA Blake Tower must mean there’s more to the Punisher’s story than the ‘lone psycho’ line everyone is running with (and, as she proved with the Devil of Hell’s Kitchen, more willing than many to make the intellectual journey from illegal actions to the functioning human beings behind them), Karen does legwork of which Ben Urich would be proud, tracking down people who knew Castle when he got the bullet wound in the head which has potentially rendered him mentally altered. She finds her way into his house and her curiosity is more piqued than ever. It’s the home of a distinguished service veteran, and clearly a very loving husband and father. The children’s drawings and toys are still everywhere in evidence (without ever tipping over into creepy psycho-shrine territory). Frank Castle the family man and Frank Castle the Punisher don’t seem to gel as two halves of the same story, but just as we’re uncovering the human side of Castle’s nature, we’re subjected to the more Tarantino edges of this episode, Cooley having him strapped to a chair in a dungeon, telling him that he dies tonight – ‘the hole’s been dug’ – and actually torturing the man on-screen for the location of his missing money, using both physical violence to Castle himself (there’s a drill and a foot involved – seriously, be warned) and threats aimed at the last vestige of the life he knew in happier times, the family dog. Given the events of episode 3, it might surprise some viewers that the Daredevil comes to rescue him from his own particular punishment, but that would be to misunderstand the nature of the man Matt Murdock is, and the quest he feels he’s on – a quest intensified in this episode by a further talk with Father Lantom, his somewhat turbulent priest, at the end of a funeral service for Grotto the gangster. Lantom tells him his guilt means his work is not yet completed – potentially rich, coming from a Catholic priest, but certainly enough of a spur for Matt to keep strapping into the scarlet suit. Here, when he rescues the Punisher, it’s a mark of respect for the character from the showrunners that Castle has already freed himself (in a truly ghastly way), and taken several of the Irish mobsters out before he’s reached the door. Their escape leads them to a cemetary, and almost to the corollary of their rooftop debate from episode 3, and there, in a scene that is entirely mesmerising by virtue of Jon Bernthal’s performance as Castle, we learn the truth about the moment that made a highly decorated serviceman snap. In a way, it’s the scene that redeems Penny and Dime, which is not by any means easy viewing thanks to its violence and torture-heavy scenes. It gives us a key to Castle’s life, his origin story, and the humanity that lies at the heart of his actions. Unable to go any further, Castle resigns himself to whatever fate has in store for him, and Murdock magnanimously gives the responsibility of taking the Punisher into both custody and hospital to his daytime friend and night time contact, Sergeant Brett Mahoney, so that the people of Hell’s Kitchen can see that the system of law and order works, that there’s a hope for justice within that system, rather than only through vigilantes like the Punisher and the Daredevil. There’s a distinct sense of anti-climax at the end of this episode – the Punisher arc feels like it has more juice left in it, but the episode seems to put the full-stop at the end of that strand of storytelling. What’s more, with the Punisher off the streets, a developing romantic tension between Matt and Karen takes its first real steps into becoming something more with a truly sensual kiss in the rain. Matt, being gentlemanly, decides not to develop that kiss into anything more that night, and the moment he does that, we know nothing will ever go quite as right again. Sure enough, the episode ends on a bombshell entrance that looks set to add significantly to the world of Daredevil as it’s taking shape in this show. Penny and Dime is a tough watch – it’s neither as satisfying as some of the more explanatory episodes of Season 1, nor as safe as some of the early episodes of Season 2. In its violence it feels like an episode where the writers woke up to that safety and went screaming over the top of what was needed. But in the scenes with Karen in Castle’s house, and with Castle and Murdock, the two outlaws, having escaped the really bad guys one more time, it gains a gravitas and a humanity that reminds us of one of Season 1’s best, Shadows in the Glass, in terms of explaining the humanity beneath the actions of a seeming villain. What happens next, we’re left unsure, but the first four episodes of Season 2 have packed an impressive punch in terms of a different approach to Wilson Fisk’s oppressive omnipresence in Season 1. Episode 4 sees that punch feel a little desperate and shocking at times, but redeems itself in a couple of scenes. It will be difficult for episode 5 to match what’s come before, especially if, as seems likely, a new ‘main villain’ thread has now to be established.